We have had the opportunity to learn the hard way how to remove wallpaper covered with multiple layers of paint. The same problem has arisen with popcorn/textured ceilings. Fortunately, we learned from our mistakes and discovered the best way to manage it. On this page, you’ll find a description of various approaches we’ve tested and what we have determined is the best method. Spoiler: the winner is covering it with drywall. A Quick Note about Asbestos. 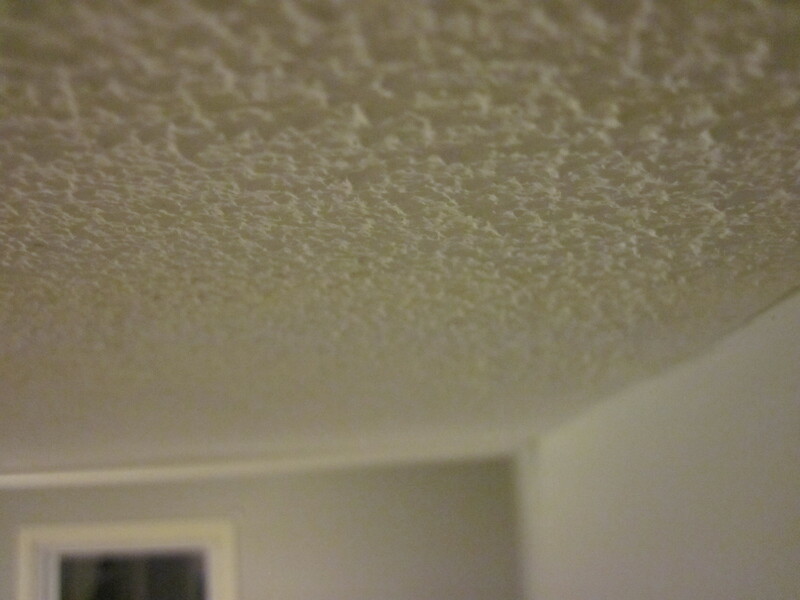 Textured paint and popcorn ceilings are sometimes made with asbestos. If you decide to sand it, cut it or in anyway mess with it, you should have the paint tested for asbestos. That’s very important and should not be a step that you skip for your own safety and health. Primer on Wallpaper Covered with Paint, Textured Paint, and Popcorn Ceilings. Before we get into the specifics about removal, we want to mention what we do not know anything about (yet): removing wallpaper that is just wallpaper. From what we’ve read, wallpaper can be removed with chemical wallpaper removers or a variety of homemade wallpaper removers. Unfortunately, when wallpaper is covered with paint, wallpaper remover runs off the wall without soaking in, which is an essential part of how wallpaper remover works. So, how do you know if you have wallpaper covered in paint? We knew when we started to paint the bedroom. The wallpaper bubbled up in places and just peeled off. If you’re painting and you don’t see any bubbling, then don’t worry about whether there is wallpaper underneath! If there is wallpaper under that paint, it’s not causing you any problems, so don’t look for problems. If it is bubbling up, then go ahead and peel up a piece. Look at your peeled-up paint chip and see if there is wallpaper that peeled up or that is left behind on the wall. Textured walls or popcorn ceilings are like wallpaper in that they’re treatments that are applied to the surface of your walls or ceilings. The difference between “texture” and “popcorn” is whether paint is involved Texture is painted on with a special type of paint; popcorn is sprayed on, like foam. Popcorn ceilings can be easier to remove than texture, because, like painted wallpaper, the remover cannot soak in and get behind the texture. COVER IT UP. Seriously, don’t try and actually remove it. Removal processes are messy and expensive. For us, we ruined a carpet (despite putting plastic down on it), inhaled volitile fumes for a few months (despite using an indoor-safe wallpaper remover), spent a solid two months of time and hundreds of dollars in wallpaper remover…. and only made it one third of the way through our sons modestly-sized bedroom. After putting in that kind of effort, we were exhausted and ready to give up. The room was never going to be ready in time for our son’s impending arrival a few weeks later, so we needed a new (faster) solution. We were watching TV one night and realized there was a much simpler solution: cover the walls in fresh drywall. It was cheaper (about $8 / sheet of drywall plus joint compound and tape). We also weren’t sure whether the paint on the walls had lead in it, since our house was built in the 1960s, so that resolved that problem as well. Ultimately, we were VERY happy with the choice. The whole thing only took a weekend or two to finish and part of that time was spent waiting for joint compound to dry. The finished product looked much better too because the walls were essentially brand new and had no cracks or dents or scratches in them any more. We repeated this process with our bedroom ceilings. Our bedroom ceilings were covered in textured paint, which made the room feel small and the ceilings feel low. We tested an area with some paint remover and instantly had flashbacks to our wallpaper project. We quit before we started, covered the ceiling with drywall, and were very happy with the result. Protect all of the surfaces of your room. It’s about to get messy. Cover the wall with paint stripper. Scrape the paint off the wall, exposing the wallpaper. Score the wallpaper (i.e. scratch it with a tool like this one). Spray wallpaper remover on the wallpaper. We tried chemical and homemade remedies. We found that a mixture of warm water and fabric softener worked (and smelled!) the best. Scrape the wallpaper off the wall and expose the naked wall behind it. Wipe the surface completely before applying new wallpaper or paint. For the textured ceiling, we also tried a chemical paint stripper. We did a small test area, but got nervous about asbestos, how long it was going to take, and whether it would expose our toddler to toxic fumes. The textured ceiling would not require as many steps as wallpaper covered with paint. All you need is the paint stripper. Sometimes popcorn ceilings can be removed with warm water and no paint stripper. For our posts on wallpaper removal, click here, here, and here. For our posts on removing a textured ceiling, click here, here, here, and here. Have you tried to remove wallpaper? wallpaper covered in paint? textured paint? a popcorn ceiling? Share your experience with us! We tried removing the wallpaper from our little daughter’s room on our own but failed. Our method didn’t work out well. This blog has really guided us very well.